Mixed Salad Annie: Product Review...the good, the bad and the ugly! I think I finally found a coffee substitute that really doesn't seem like a coffee substitute. It's called Teeccino and you make it just like coffee. It brews right in the coffee maker or any other way you can make coffee, even in an espresso machine. The company calls it "herbal coffee". And as you probably noticed the symbol above, it's caffeine free. When I was looking at this at the supermarket, reading the label, I can tell you that I was very skeptical. But I figured, what the heck, I've spent $7.00 on worse things. So I picked up two flavors- the Vanilla Nut and the Maya Caffe, which is organic. I tried the Vanilla Nut. 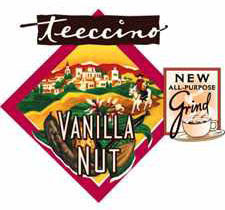 The description the company gives it is -" The creaminess of organic Mexican vanilla highlights Teeccino's dark, robust body which is accented with golden roasted almonds and tropical nuts including coconut." Sounds good, right? Well kids, after on sip, my skepticism turned into belief. The stuff is really good. Plus according to the info on the can, it's also good for you. It has a lot of potassium in it, which is good for your heart. It claims to give you a natural energy boost - from nutrients, not stimulants. It is alkaline, which helps reduce acidity and restore alkaline balance. It is also rich in inulin, a soluble fiber in chicory root, that helps improve digestion and elimination plus increases the absorption of calcium and minerals. Leave it to the Californians to come up with a healthy coffee. The aroma and the flavor reminds me a little of espresso. It is a very deep flavor, but not bitter or over powering. Actually, I didn't even need sugar! That in itself is amazing!!! I'm going to look for this, but I'm pretty sure we don't have it here. I'm a coffee nut. Sounds nice but I always need my coffee fix to start the day or I'm totally useless.